The horizon warmed with light at its edges. 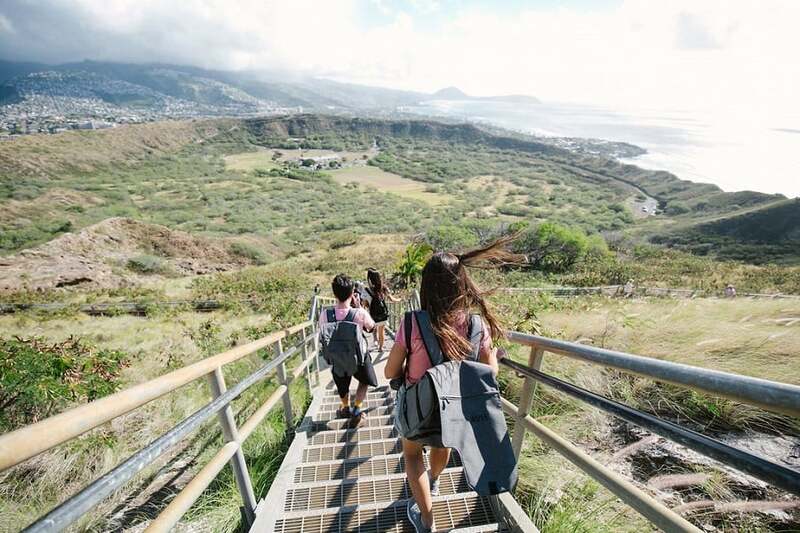 We parked at Kapi’olani Community College and started up the trail leading to Diamond Head, a seven-minute drive away from ‘Alohilani. Farmers and vendors were setting up for the Saturday Farmer’s Market opening as we made our way. Cool air in the predawn got us moving up the gentle paved roadside trail. We took in the quiet and embraced the extra few minutes climbing from the college. The promise of finishing our hike with a perfect parking spot for exploring the market on our return made us feel like we’d had our first successful life hack of the day. 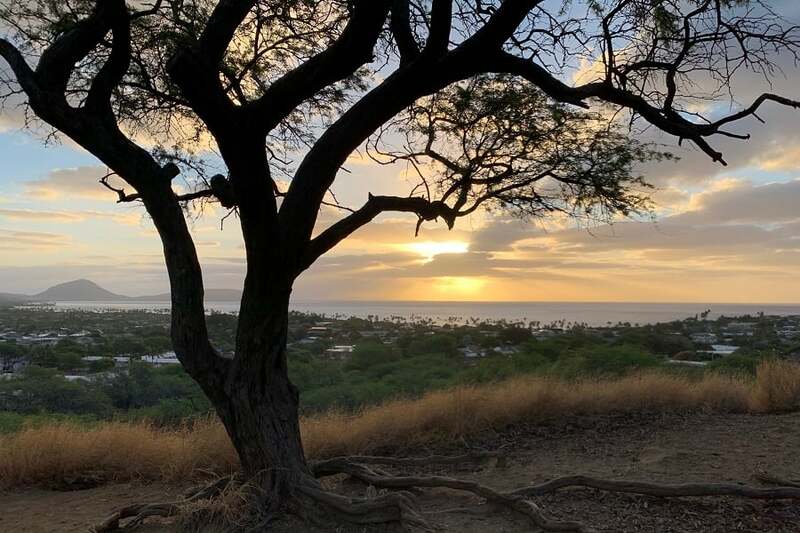 Walking past tall grasses and kiawe (a type of mesquite tree) and looking east to catch the sun rising over the ocean and Hanauma Bay that leads to the center of Diamond Head and Fort Ruger. Inside, the parking lot lay on the gentle slopes, along with the expected restrooms and snack stand near the entrance gate. The predawn runners were just making it back from the top as casual hikers were showing up to snap a quick selfie by the signage before hitting the trail. At 750 feet elevation gain to the apex, we joined a relaxed stream of hikers of every age and ability winding up the trail. 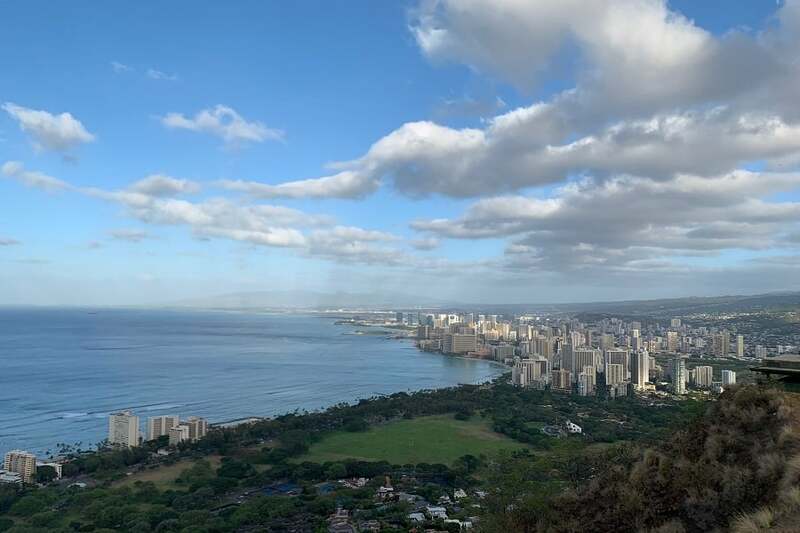 We wound switchbacks and mixed paths on a hike that went from tropical paradise to urban scene and back again, taking advantage of historical markers, outlooks and hidden pillbox lookouts left over from WWII to catch our breath until we reached the summit. Looking out over half the island as the sun came back into view, the breeze rewarded hikers as they looked out from their vantage point. It was powerful to think about the people and cultures over the ages who’ve shared this view at sunrise, who’ve seen how small we are in the moment, able only to imagine what it must have felt like to catch Diamond Head on the horizon from an outrigger canoe in the open ocean 1,000 years ago. Forty minutes up, and half that coming down, the trail was filled with lighthearted friends and locals sharing weekend time, with families wrangling the kids to stay on trail as we circled back to the car. The Saturday Farmer’s Market was in full swing. We grabbed pineapple treats and acai bowls and walked the market, taking in the vibrant morning energy.